FIMA Securities is providing services in securities trading, portfolio management, company take-overs, management and employees buy-outs and more. FIMA Securities is among leading and one of the oldest investment companies in Croatia. Zagreb Stock Exchange is their domicile market and they have branches in Bosnia and Herzegovina (Sarajevo Stock Exchange and Banja Luka Stock Exchange) as well as a strategic partner in Serbia (Belgrade Stock Exchange). By continuously improving their online trading platform and training their staff they are dedicated to offering outstanding investment services to their clients. Therefore, if you need an online securities trading platform that is quick, intuitive, safe and reliable with plenty of options, offering DMA, real time quotes and market depth, FIMA eTrade is your number one choice. The platform is suitable for beginners as well as advanced or professional traders. Fees are competitive and tailored to the client's scheduled turnover while opening an account is free of charge and there is no deposit limit. If you have any problems using FIMA eTrade system, their customer services is always available for you. Zagreb Stock Exchange has a total of 335 listed securities (258 stocks) and a market capitalization of HRK 200 billion (EUR 27 billion). In 2010 overall turnover totaled to HRK 12.9 billion (EUR 1.7 billion) while regular stock turnover amounted to HRK 5.8 billion (EUR 0.8 billion). CROBEX is the official stock index while CROBEX10 consists of Croatian "blue chips". In 2010 CROBEX increased by 5.3% while CROBEX10 gained 9.5%. Settlement in Croatia is on the third workday after the trade date (T+3) while there is no capital gain tax or dividend taxes. The procedure of opening an account with FIMA Securities is simple and fast. You can become their client by following three easy steps to register for FIMA eTrade system. Sign a brokerage services contract and open an account without fees and without limitations on your trading account size. You can choose from regular, portfolio, margin and custodian accounts. Once you've created your account and deposited funds, you can log on FIMA eTrade website and start trading immediately. It is important to note that before you can start trading in Croatia you must obtain OIB (Personal Identification Number) from Croatian tax administration office. FIMA Securities will be pleased to assist you in the process or even perform it instead of you if you grant them the power of attorney. Brokerage fees are competitive, and you can choose from several packages depending on your planned quarterly turnover. You can also choose to pay the brokerage fee for every trade you make or to pay it in advance by "buying" a turnover package and then trade with no fees until you have reached your package's turnover. 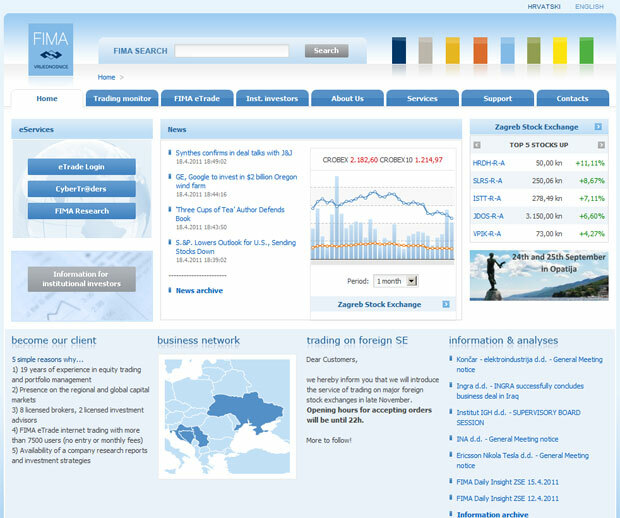 FIMA Securities offers stocks trading on Zagreb Stock Exchange and all major world markets. They also offer portfolio management services with customized portfolios for individual clients. By creating an optimal investment strategy for each client they try to meet client's investment goals while acknowledging their risk tolerance. FIMA Daily Trader service is designed for clients who actively trade most liquid stocks on a daily basis. For your cash deposit they give you a 5-10 times trading leverage but you are obliged to close all positions within the same trading session. Their other services include investment advisory, underwriting and agency services, as well as corporate broker services and sale of investment fund units. They also offer clients to issue orders via telephone although brokerage commissions are somewhat higher. Their advanced and improved online securities trading system, FIMA eTrade, is intuitive, quick and simple to use for both beginners and demanding professional investors. Their team of experts has developed one of the most sophisticated platforms offering significantly more options and information compared to similar trading systems in Croatia. Trading securities through their trading platform FIMA eTrade provides a wide range of benefits: insight into the movements of stock prices on Zagreb Stock Exchange in real-time, market depth display up to 50 buy and sell orders, Direct market Access (DMA) system, access to fundamental analysis of stocks, daily update of the domestic market, intraday and technical analysis of stocks, monitoring the latest national and international news, contacting your broker through chat and a host of other benefits. On their website there is a section for investors' education so you can acquire additional information about the terms that you did not know and you wanted to learn. Supporting customers is of huge importance for FIMA. For any questions about FIMA's services, opportunities, software support or any other question FIMA staff will respond to you as soon as possible. Their team of brokers is available to you at all times be and will provide you with an answer to the question of FIMA Securities investment services via phone, email or online chat. Quick, intuitive, and safe online trading platform. Opening orders through a broker is the most expensive. Internet platform does not support the possibility of trading in foreign markets. FIMA Securities is an online brokerage house for those people who at any time want to have an insight into the movements of stock prices in real time via their mobile phones or computers. Immediate execution of orders can react promptly and thus achieve the desired benefits. Open an account now. 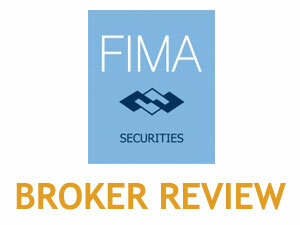 What Is Your Experience With FIMA Securities? Enjoy the update of the best discount broker list in several different categories investors find most important when selecting online stock broker. If you are new to investing or not satisfied with current broker, this online broker comparison tool will help you choose the best brokerage for your needs. Charles Schwab Bank offers investing and financial guidance you need to make smart decisions, plus a range of investment services - online investing. Etrade Financial provides online investing and stock trading including: stocks, options, mutual funds, ETFs, bonds, futures, and mobile trading apps. Fidelity Investment Services is an online trading brokerage offering investment solutions to help you find your way, whatever your destination. Firstrade online stock broker offers stock trading, options trading, mutual funds, bonds with no minimums to start investing and no inactivity fees. Interactive Brokers is deep discount electronic access broker offering online trading of Stocks, Options, Futures, Forex, Bonds and quality executions. MB Trading is a direct access brokerage firm that develops and markets sophisticated yet simple direct access trading technology to online traders. Merrill Edge is a new Merrill Lynch online discount brokerage providing financial advice and investment banking services, which is now owned by BOA. OptionsHouse Brokerage is an online broker focusing on stock options trading featuring a professional grade platform and low fees and commissions. With optionsXpress you can trade stocks, options, and futures in one account. Take advantage of free education, powerful tools and excellent service. Invest with Scott Trade to access robust trading tools & market research. No maintenance or inactivity fees for easy online trading and investing. Share Builder takes online stock trading to a new level thanks to a wealth of tools, research and knowledge. Great for long-term investment plans. TDAmeritrade online broker services include online stock trading, online investing and retirement planning to help you pursue your investment goals. TradeKing is an online broker providing tools and research for online trading of stocks, options, bonds and more. Best site usability among brokers. Vanguard brokerage-investment company can help you invest, keep your costs low, and focus on what matters most to your long-term financial success. Zecco Trading is an online stock broker that offers low cost stock trading, discount options pricing and a powerful and easy-to-use trading platform.